Welcome to CLF PlantClimatics. We are a leading supplier of plant growth and entomology chambers. As the exclusive partner of Percival Scientific Inc. in Europe, we offer a broad spectrum of chambers from compact LED chambers to large area multi-purpose plant growth chambers. Our research-grade PlantMaster walk-in rooms can be equipped with multi-tier GroBanks or high light intensity lampbanks. The CLF patented GroBanks can be also adapted to existing rooms. 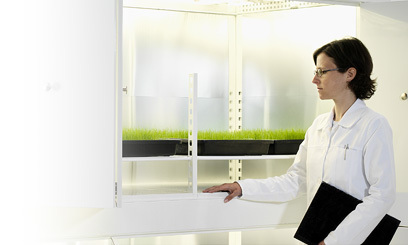 No matter if you are working with arabidopsis, algae, tobacco, cereals , physcomitrella, fungi, medicago, weeds, potatoes or drosophila, aphids, sand-flies mosquitoes or cockroaches or any other species - we will find the perfect chamber for your research work. We take care to listen and understand what you need before offering advice on which chamber could be most suitable for your application. All chambers we supply are installed, tested and commissioned on site by our own fully trained technicians - all you need to do is open the door of the chamber and put your cultures in. A comprehensive warranty supported by a 72 hour after-sales service throughout Europe provides the security of years of trouble-free operation.